It finally happened! Marvel and Disney officially dropped the epic full-length trailer for Avengers: Infinity War. And it blew the roof off the world. Now, it has been announced that tickets are officially on sale. And with that comes the promise of a free poster with a special VIP purchase. You can see the tweet and posters below. Yes, survivors of Earth, Advance tickets on Fandango are now on sale for the year's most anticipated movie, Marvel's Avengers: Infinity War, only in theaters on April 27. In a Fandango survey of over 8,000 film fans, the majority of moviegoers picked Infinity War as the most anticipated movie of 2018. 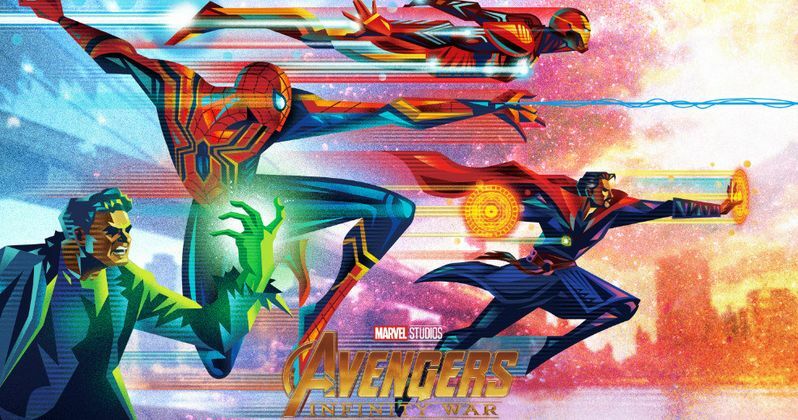 With every Fandango VIP purchase of Infinity War tickets, Fandango FanShop is offering a complimentary Infinity War poster by popular artist Kaz Oomori, while supplies last. Fans have the option to choose one of five exclusive posters featuring Black Panther, Okoye, Iron Man, Captain America, Spider-Man, Hulk, Black Widow, Guardians of the Galaxy and many others. Says Fandango Managing Editor Erik Davis. "Avengers: Infinity War represents the culmination of a story that first began with 2008's Iron Man. Moviegoers have been waiting ten years to see all of their favorite Marvel Studios characters together in one movie, and the promise of epic battles, dazzling effects and revealing moments makes it the most anticipated movie of the year." Infinity War will be in theaters six weeks from now. But rest assured, all the true believers will have those tickets in their hands today. The time is now, the place is here. So put down that down and help save the world like only you can. This latest Marvel sequel features over 70 actors from every corner of the MCU. This is the culmination of a decades worth of adventure, excitement, thrills and heartbreak. This is the ultimate bookend to 22 movies in a franchise that has been keeping the box office bumping since 2008, and will continue on through 2019 with Avengers 4. Captain America trilogy writers, Stephen Markus and Christopher McFeely. Marvel has released this official synopsis. "An unprecedented cinematic journey ten years in the making and spanning the entire Marvel Cinematic Universe, Marvel Studios' Avengers: Infinity War brings to the screen the ultimate, deadliest showdown of all time. The Avengers and their Super Hero allies must be willing to sacrifice all in an attempt to defeat the powerful Thanos before his blitz of devastation and ruin puts an end to the universe." Fandango is the ultimate digital network for all things movies, serving more than 60 million unique visitors per month, according to comScore, with best-in-class movie information, ticketing to more than 30,000 U.S. screens, trailers and original video, home entertainment and fan merchandise. Its portfolio features leading online ticketers Fandango, MovieTickets.com and Flixster; world-renown movie review site Rotten Tomatoes; and Movieclips, the #1 movie trailers and content channel on YouTube. Fandango's movie discovery and ticketing innovations can also be found on mobile, social, AI and voice platforms from Apple, Facebook, Google, Amazon, and others. Fandango's video on-demand service, FandangoNOW offers new release and catalog movies and next-day TV shows to more than 200 million connected, over-the-top (OTT) and mobile devices, while Fandango FanShop curates unique and exclusive fan gear and collectibles. In Latin America, the company operates leading online ticketers Ingresso.com and Fandango Latin America. You can check out the five new posters free with VIP purchase here, along with the new Avengers trailer once again, because we know you need to see it at least five more times before you finish that first cup of coffee.